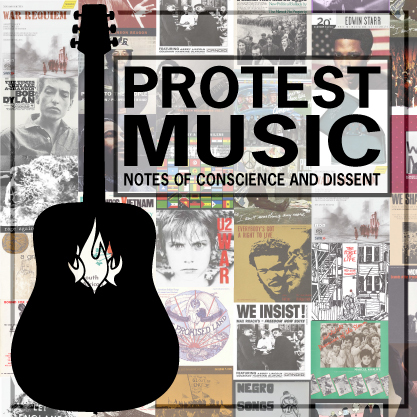 In honor of musicians who know the power of song as a contribution to social change, who have risked everything to challenge an unjust world, and whose music resonates with the voices of those marginalized in a world of power, greed, selfishness, and tyranny. Let’s not merely honor them as role models. Let them be inspiration so that we may follow in their footsteps. Teachers, students, parents, and community activists are rising up and speaking out at great risk to their professional and personal lives. They are being fired, condemned, kicked out, expelled, and even jailed. The reformers, politicians, and billionaires hope their examples will create fear and retreat. We need to show them that quite the opposite is true. Our numbers are growing. And we will rise up … singing. In honor of Pete Seeger who passed away this week at the age of 94 and all artists of courage and conviction. Nine Tibetan singers were jailed after they wrote and performed songs celebrating Tibet, opposing China’s occupation and calling for freedom. Music is a vital part of Tibetans’ resistance to Chinese rule. Singers like these not only keep alive a culture that China is trying to erase from the world, but their songs articulate the aspirations, fears and courage of a people who remain proud and defiant after 60 years of occupation. Looking closely at the chart (click to enlarge) you can see three central players in the education reform movement have all come from the same lineage: Sir Michael Barber (Pearson), David Coleman (College Board and CCSS), and Lou Gerstner (Achieve). Indeed, the stars have aligned for McKinsey and Co’s role as the cornerstone of education reform. They have been the leaders in crafting the dominant narrative of an education crisis for decades, and now deeply entrenched in education reform policies, they are reaping the financial and political benefits of marketing solutions to the problems they manufactured in the first place. With key players in place in all areas of education reform, McKinsey has situated itself to be the delivery boy, and financial recipient of billions of education dollars. 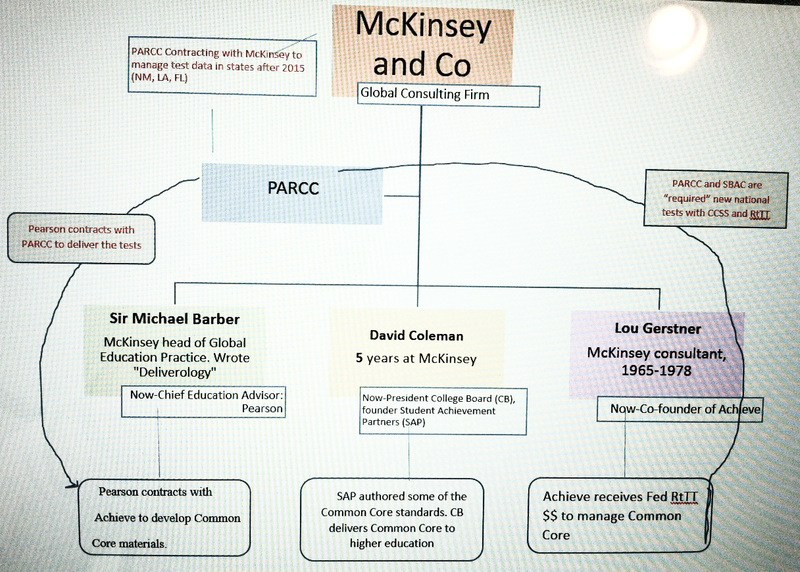 Why is Louisiana partnering with McKinsey to manage PARCC? Ask Bobby Jindal, Governor of LA was formerly a partner at McKinsey for five years. Governments and large public organizations including Louisiana school system have systematically adopted Sir Michael Barber’s ‘deliverology’ approach and realized quick impact and significantly improve outcomes to their reform programs. Why Rhode Island? Ask husband of Gina Raimondo, (democratic candidate for R.I. governor in 2014, architect of R.I.’s reduced pensions for teachers, former hedge-funder and darling of neo-liberals) Andy Moffit who specializes in school projects for McKinsey. He co-authored the ed reform Bible Deliverology with Sir Michael Barber now at Pearson. He joined McKinsey in 2000. But it’s not just PARCC. 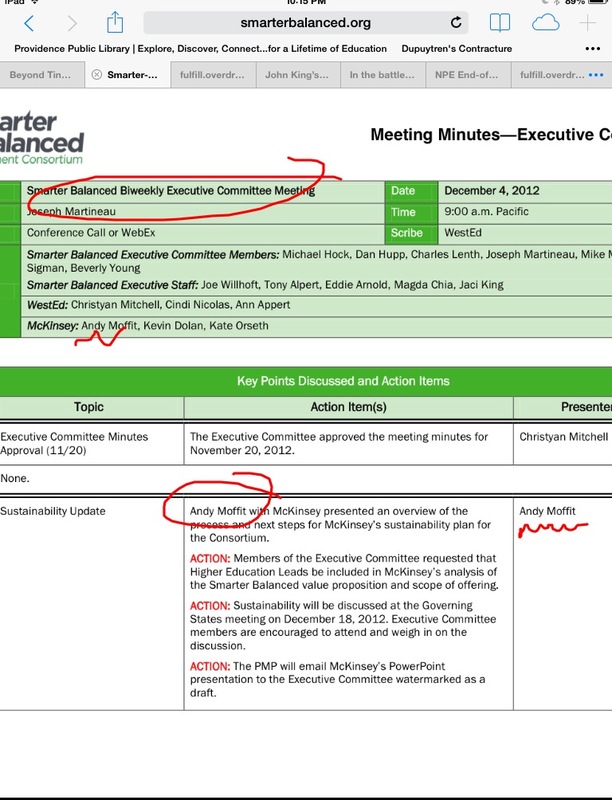 SBAC has employed McKinsey to conduct research into developing a detailed sustainability plan as well. Lumina (a member of ALEC) gave a $200,000 grant to CCSSO to support an inquiry by McKinsey & Co concerning the sustainability and operations of the two Common Core State Standards/Assessment (CCSS/A) consortia post 2014. “Their consultants played critical roles in planning the restructuring of the New York City schools under Chancellor Klein. In 2007, McKinsey published a report on the commonalities of what the firm considered excellent school system. NYC reform was lauded in that report. Now, following an intensive study of NAEP scores and state testing, McKinsey concludes that “the city school system had not demonstrated the scale of improvement necessary.” (EDVOX-Carol Boyd). 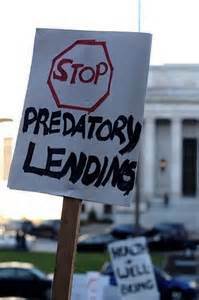 Bear in mind it’s not just in the areas of Common Core and national testing that they have their tentacles. McKinsey’s key areas of educational interest are data collection (Big Data mantra) and information technology. McKinsey corporate alliances also include Wireless Generation and Bill Gates, among scores of others too many to mention. And of course McKinsey partners and consultants will be ready to deliver the goods and smiling all the way to the bank, while schools, children, and communities languish in their shadow.